T-Bone car accidents, also known as side impact collisions, can cause drivers and passengers to suffer severe injuries. In extreme cases, they can result in victims’ deaths. T-Bone accidents are unique because unlike other types of collision, such as rear end or head-on collisions, victims of t-bone collisions are only separated from the colliding vehicle by a thin door and window. The window can shatter on impact, showering the victim in tiny shards of glass as he or she comes into contact with the colliding vehicle’s hood. Although it might seem obvious that the colliding driver is at fault in this type of accident, the truth is that this is not always the case. Sometimes, the driver of the vehicle that is hit is found to be the negligent party and in other cases, a third party is deemed to be responsible for a t-bone collision. If you are injured in a t-bone collision or any other type of car accident, seek medical attention for your injury. Then, consider working with an experienced personal injury lawyer to pursue compensation for your damages. 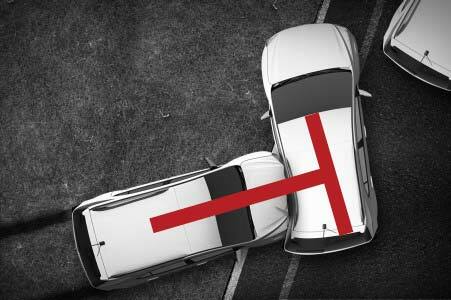 A t-bone collision looks like this: one car broadsides the other, making a “T” formation. Generally, this type of collision occurs when one driver does not give the other driver the right of way. For example, when a driver drives through a red light into an intersection where others are rightfully passing perpendicular to his or her position, that driver can t-bone another vehicle and be found to be negligent. But if he or she has the right of way and collided with another vehicle that should have been stopped at a red light in that intersection, the other driver may be at fault for the collision. More than one driver can be at fault for a t-bone accident. Imagine that two drivers have stop signs, not traffic lights, determining the right of way at an intersection. Driver A fails to stop at the stop sign and t-bones Driver B, who would have seen Driver A and potentially avoided the collision if they had not been text messaging. In this scenario, some of the blame might be assigned to Driver B because although they had the right of way, they too were acting negligently and could have prevented the accident by taking proper care. In Texas, a negligent party can recover compensation for his or her damages in an accident as long as he or she is deemed to hold 50 percent or less of the responsibility for the accident. Determining fault in your car accident requires the use of evidence like photographs, eyewitness accounts, and the official police report for the accident. In the moments following your collision, take as many photographs of the affected areas of both vehicles as you can. Show the collision from multiple angles and the damage suffered by both vehicles. The official police report will include details about the collision that can be used to determine fault, such as whether any local ordinances were broken. 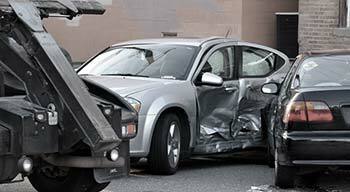 A successful car accident claim does not just demonstrate that a driver was negligent. It demonstrates that because of the driver’s negligence, an accident occurred and because of that accident, a victim suffered an injury that caused him or her to suffer substantial financial damages. In addition to the evidence discussed above, you will need to use evidence like your medical bill and input from your doctor to demonstrate that you suffered a specific injury in the collision and that you need certain medical treatment. To demonstrate your lost wages, you can submit a pay stub showing what you normally earn and the time at work you had to miss to recover. Texas is a “Fault State”. What Does That Mean for Your Car Accident Claim? Right Turn Accident, Who is at Fault?